PeptoBismol is an over-the-counter remedy produced by Procter and Gamble for minor digestive upsets, including nausea, heartburn, diarrhea, and sour stomach. It is sold in the US, Canada, and the UK. It has been soothing stomachs for over 100 years, with an active ingredient (bismuth subsalicylate) in a bright pink liquid form. It was first marketed as “Bismol Mixture Cholera Infantum” when developed by a doctor in New York state in 1901, and was produced by Norwich Pharmaceutical Company. In 1919, the name was changed to just PeptoBismal and was offered in the thick pink liquid form with a strong wintergreen flavor added. Procter and Gamble purchased the product in 1982, which by then was also available in tablets (1973); P&G would also offer “Pepto” in caplets in 1990. The product has even created a color shade (PeptoBismol Pink), which is readily recognizable. How PeptoBismol actually works is still being studied, but it is known that the product “coats” the stomach walls, preventing any further irritation of the lining, reducing stomach lining irritation, and “soothing” the digestive track. There have been warnings about using this in children under 12, since the subsalicylate is similar to aspirin and may trigger Reyes syndrome. PeptoBismol is available in the original liquid form (in Orange, Cherry, Maximum Strength varieties), easy to swallow caplets, and chewables (in orange and cherry flavors). The “To Go” package is very popular, since it is compact and convenient for travelers. There are also children’s strength items available. 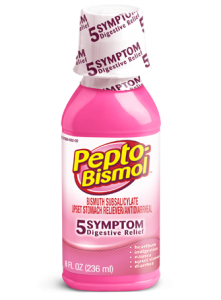 PeptoBismal offers an inexpensive remedy for common stomach upsets; approximately 40% of all households in the US have some form of Pepto in their medicine cabinets. The Health and Well Being segment of P&G, of which Pepto is a member, regularly produces 18% of the company’s profits. It has even been used in oil spill disasters to sooth the stomachs of affected birds who have ingested the harmful oils.